Quarterback once again will be critical for the Buffalo Bills’ draft plans. Only this year, instead of hoping the right quarterback fell to them, the Bills will be rooting for quarterbacks to be chosen ahead of them. With Josh Allen in place, the Bills don’t need a quarterback, but could go in several directions with their first-round draft pick, scheduled for No. 9 overall. If, say, two quarterbacks go in the first eight picks, the Bills would get, at worst, the seventh-ranked player on their draft board. With quarterback-needy teams like Denver (No. 10), Cincinnati (No. 11), Miami (No. 13) and Washington (No. 15) picking behind them, the Bills might also be in prime position to move down a few slots. 1. Arizona Cardinals. Kyler Murray, QB, Oklahoma. No change from Mock 2.0 here. Murray to Arizona just makes too much sense, setting up a trade of Josh Rosen. More on that later. 2. San Francisco 49ers. Nick Bosa, DE, Ohio State. The 49ers have been prominently mentioned as a trade-back candidate, but for now we’ll hold off on projecting that and instead have them take Bosa, a player many analysts believe is the best prospect in the draft. 3. New York Jets. Josh Allen, Edge, Kentucky. 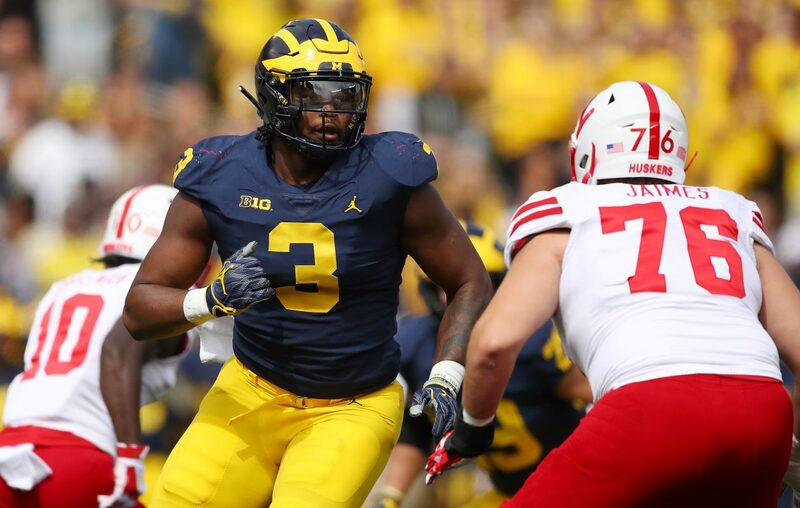 The Jets’ new pass rusher will be chasing the Bills’ quarterback of the same name for the next decade, both teams hope. 4. Detroit Lions (projected trade with Oakland). Quinnen Williams, DT, Alabama. Defensive tackle isn’t the Raiders’ biggest need – that would be a pass rusher – which explains why they’re comfortable sending that pick to the Lions. Williams would pair with Trey Flowers to give coach Matt Patricia a formidable defensive front. 5. Tampa Bay Buccaneers. Devin White, LB, LSU. This might be the most popular mock selection right now. That makes sense given the Bucs’ need and White’s ability. 6. New York Giants. Dwayne Haskins, QB, Ohio State. Giants General Manager Dave Gettleman needs something to excite the fan base, and nothing does that like drafting a quarterback. It’s also a bit of job security for Gettleman, given that Haskins should get at least two years on the job. It’s possible Gettleman doesn’t last that long without a quarterback. 7. Jacksonville Jaguars. Jawaan Taylor, OT, Florida. The Jaguars just paid Nick Foles a billion dollars (or thereabouts), so it makes sense to protect him. Taylor would give coach Doug Marrone an immediate starter. 8. Oakland Raiders (projected trade with Detroit). Montez Sweat, Edge, Mississippi State. The Raiders get their edge rusher in a draft slot that makes more sense. They add a second-round pick (No. 43 overall) and a late-round selection to move down. 9. Washington Redskins (projected trade with Buffalo Bills). Daniel Jones, QB, Duke. The first big surprise of the draft. Scouts feel NFL teams like Jones more than most mock drafters. 10. Denver Broncos. Drew Lock, QB, Missouri. Just like last year, four quarterbacks go in the top 10. Lock can sit behind Joe Flacco for a year (or thereabouts), just like Lamar Jackson did at the start of 2018 in Baltimore. 11. Cincinnati Bengals. Devin Bush, LB, Michigan. With four quarterbacks gone, the Bengals can’t force the issue at the position. Instead, they fill a big need on defense. 12. Green Bay Packers. Jonah Williams, OL, Alabama. New coach Matt LaFleur will want to build the offense around quarterback Aaron Rodgers. Getting a versatile player like Williams is a good start. 13. Miami Dolphins. Ed Oliver, DT, Houston. The Dolphins likewise miss out on the quarterback run, but landing Oliver – thought to be a top-10 talent – at No. 13 is a nice consolation prize. 14. Atlanta Falcons. Christian Wilkins, DT, Clemson. The Falcons used the franchise tag on defensive tackle Grady Jarrett, which means they need to prepare for his possible departure after the 2019 season. 15. Buffalo Bills. Rashan Gary, DE, Michigan. This would be a dream scenario for the Bills. Moving down six spots nets them two more top-100 picks (No. 46 in the second round and No. 96 in the third round) and still allows them to check off one of their biggest remaining needs with a player several analysts project as a possible top-10 pick. Gary went to Michigan as the top recruit in the country, bringing with him lofty expectations that maybe weren’t always met. His sack production as a junior in 2018 was not great (he finished with 3.5), but Gary’s physical tools (6-foot-4, 277 pounds, 4.58-second 40-yard dash) have to intrigue Bills coach Sean McDermott. The Bills need reinforcements at defensive end, particularly with Jerry Hughes and Shaq Lawson heading into the final year of their contracts. 16. Carolina Panthers. Brian Burns, Edge, Florida State. Burns needs to bulk up, but he’s explosive off the edge. 17. New York Giants (via Cleveland). D.K. Metcalf, WR, Ole Miss. Having already drafted their quarterback, the Giants get him a weapon with the pick acquired from the Browns as part of the Odell Beckham Jr. trade. 18. Minnesota Vikings. Andre Dillard, OT, Washington State. The Vikings need help across the offensive line. Dillard excels as a pass blocker – a good trait for an offense that wants to let Kirk Cousins throw the ball to Stefon Diggs and Adam Thielen a bunch. 19. Tennessee Titans. T.J. Hockenson, TE, Iowa. Hockenson could be a consideration for the Bills, but the idea of taking a tight end in the top 10 of the draft is tough to swallow. That’s not a problem for the Titans here. 20. Pittsburgh Steelers. Byron Murphy, CB, Washington. There is no consensus on the top cornerback available this year, but the Steelers get to take their pick at the position in this scenario. 21. Seattle Seahawks. Greedy Williams, CB, LSU. Murphy’s selection starts a brief run on cornerbacks. Williams will have to answer questions about his willingness to tackle, but he’s elite in coverage. 22. Baltimore Ravens. Clelin Farrell, Edge, Clemson. The Ravens said goodbye to Terrell Suggs and Za’Darius Smith in free agency, so they need to rebuild the pass rush. 23. Houston Texans. Cody Ford, OT, Oklahoma. There might not be a team in the league that needs offensive linemen more than Houston. Ford can play tackle or guard. 24. Oakland Raiders (via Chicago). Josh Jacobs, RB, Alabama. Adding a first-round running back to an offense that acquired Antonio Brown this offseason should make quarterback Derek Carr a happy man. 25. Philadelphia Eagles. Deandre Baker, CB, Georgia. The Eagles allowed the third-most passing yards in the NFL in 2018. 26. Indianapolis Colts. Dexter Lawrence, DT, Clemson. Even though he’s 340 pounds, Lawrence is more than just a run-stuffer. 27. Oakland Raiders (via Dallas). Rock Ya-Sin, CB, Temple. His name just screams “Raiders,” doesn’t it? 28. Los Angeles Chargers. Dalton Risner, OL, Kansas State. A second-team All-American, Risner projects as a right tackle at the next level, although he has played inside, too. 29. Kansas City Chiefs. Garrett Bradbury, C, N.C. State. With Mitch Morse in Buffalo, the Chiefs could use another option at center. Bradbury is thought by scouts to have a low “bust” risk. 30. Green Bay Packers (via New Orleans). Noah Fant, TE, Iowa. Jimmy Graham looks to be just about finished. Fant is an excellent athlete who compares to a younger Graham in many ways. 31. Los Angeles Rams. Jeffery Simmons, DT, Mississippi State. The Rams will have to wait a year as Simmons recovers from a torn ACL, but it’s worth it to pair him with Aaron Donald. 32. Arizona Cardinals (projected trade with New England). Marquise Brown, WR, Oklahoma. The Cardinals send Rosen to the Patriots for the final pick of the first round, producing a stream of expletives in Buffalo, New York and Miami while giving New England its quarterback of the future. The Cardinals use the pick to reunite Murray with Brown.